I think you’ll agree with me when I say: we all love the unassuming Aussie sports star. With a friendly and modest nature, their down to earth character makes us warm to them instantaneously. Yet the intrigue we have with these individuals is driven by an array of idiosyncratic behaviours that make them so successful in their given sporting discipline. Immense focus, determination, willpower and competitiveness are example behaviours that provoke superhuman actions, going beyond what many perceive as physically and mentally possible. So with this in mind, what does our next generation Aussie cycling proposition look like? Last weekend the You Yangs, Anakie, and Geelong in Victoria played host to the Under 19 Australian National Championships. The 3-stage event gave us a taste of Australia’s next generation in cycling. 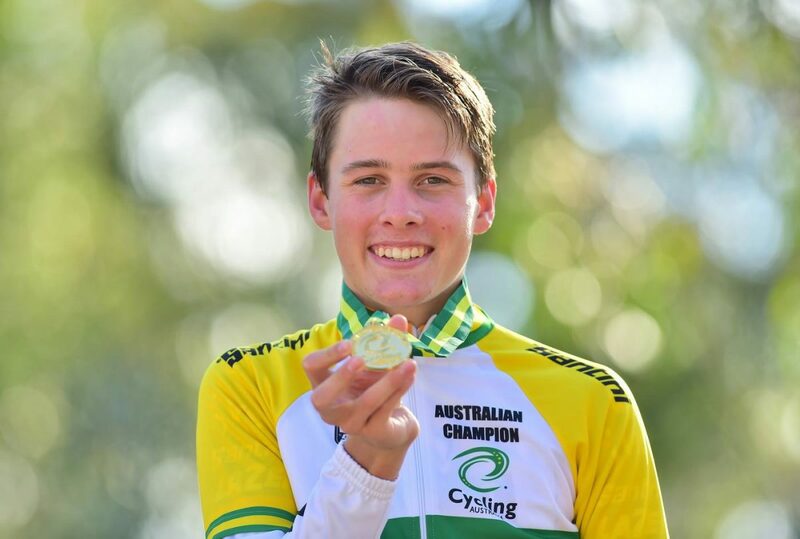 Mitchell Wright of Illawarra Cycling Club was impressive in the 113 kilometre road race, breaking away from the lead break to win solo by 52 seconds, and Bryce Lanigan demonstrated his strength in a bunch sprint finish in the criterium final on Sunday. Yet it was Friday’s time trial event that really captured our attention. The participants of an Under 19 Championship range from 16-year-olds to 18-year-olds. They are young kids with raw talent. 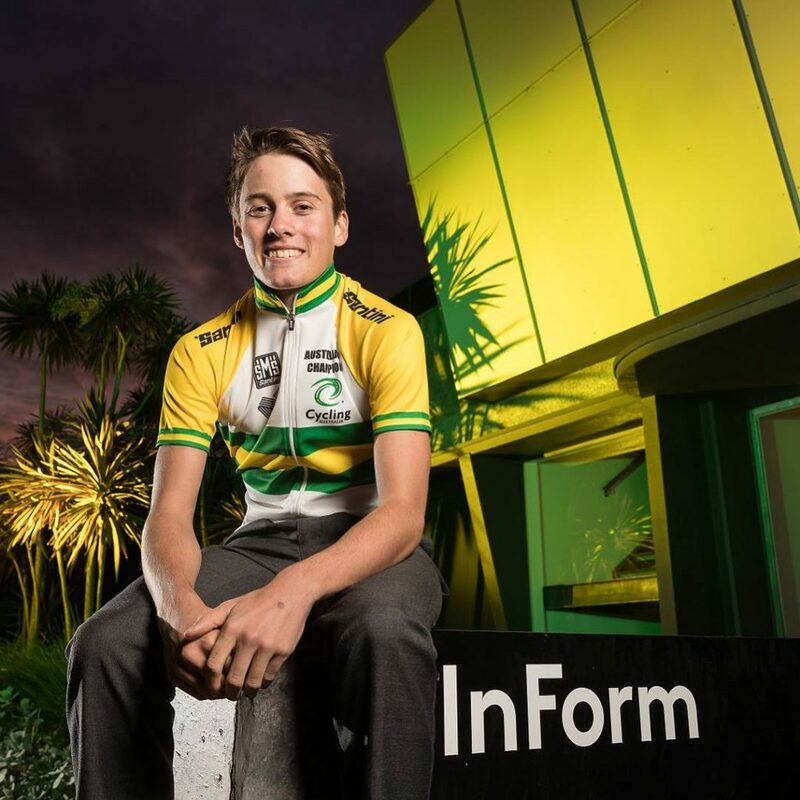 Given the right guidance and coaching, this talent could lead them to the professional ranks of cycling and perhaps even to wearing the green and gold on the world stage. When you think of an event that exposes raw talent more than anything, the time trial tops the list. Not to take anything away from the road race and the criterium, as those events are equally if not more demanding and require a well-executed race stagey to cross the line in a winning position. But given the variables of 80+ riders who start together as a bunch, it’s no wonder why the individual time trial is known as the “race of truth”. There’s no hiding behind the wheel – it’s you vs. the clock. On Friday the 16th of June 2017, Tom Jones from Carnegie Caulfield CC warmed up on the trainer, preparing himself for a very technical 22 kilometre time trial. With butterflies in his stomach, he went through his warm-up routine, sensing the feeling in his legs and their readiness for 30 minutes of unrelenting pressure. They felt good, really good. When Tom hit the start line, he couldn’t feel his legs; a good sign according to Tom. The butterflies had turned into adrenaline and the countdown clock ticked and tocked, down to 0. The first part of the course included a two-kilometre climb. Tom’s adrenaline ever-so-slightly got the better of him out of the gate, but with careful focus and consideration he wound the lactic out of his legs on the slight descents, while hitting the corners with precision and keeping eloquently still. When Tom crossed the finish line, he realised that he’d set a blistering winning pace of 42.2 kilometres per hour on a very technical course in the You Yangs. The elation set in as Tom’s hard work and dedication had paid off. He’s won the race by a total of 8.7 seconds to his nearest second place rival, Elloit Scheltz from Hamilton Wheelers CC. 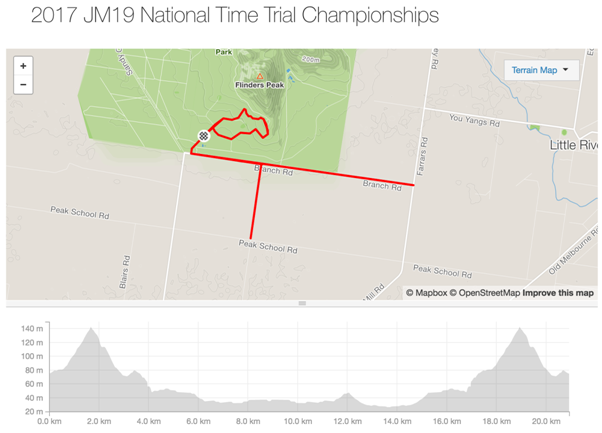 This was a true demonstration to the Australian cycling community of Tom’s strong ability to ride against the clock, with extreme power output and technical nous. At the tender age of 17, this is raw talent on a platter. Tom has grown up surrounded by bikes. Ironically, his mum Caz Jones got into cycling to provide some well-earned freedom when Tom and younger brother Ben were growing up. The cycling bug infected the family, including Tom’s dad Damien Jones who runs Hampton Cycles and is quite a handy Masters road and mountain bike rider himself. Being surrounded by parents who are intimately involved in the cycling community, Tom has been riding road bikes since the age of 8. He’s been involved in track cycling, criterium racing, and had exposure to some of the best foundational cycling programs Melbourne has to offer for up-and-coming kids. In 2015 Tom began to see a rapid progression in his cycling ability when he joined Melbourne based amateur cycling team InForm Tineli. He rubbed shoulders with older, more experienced riders, learning from the likes of NRS cyclist Darcy Woolley and well-respected Carnegie Caulfield club racer Dale Woonton. 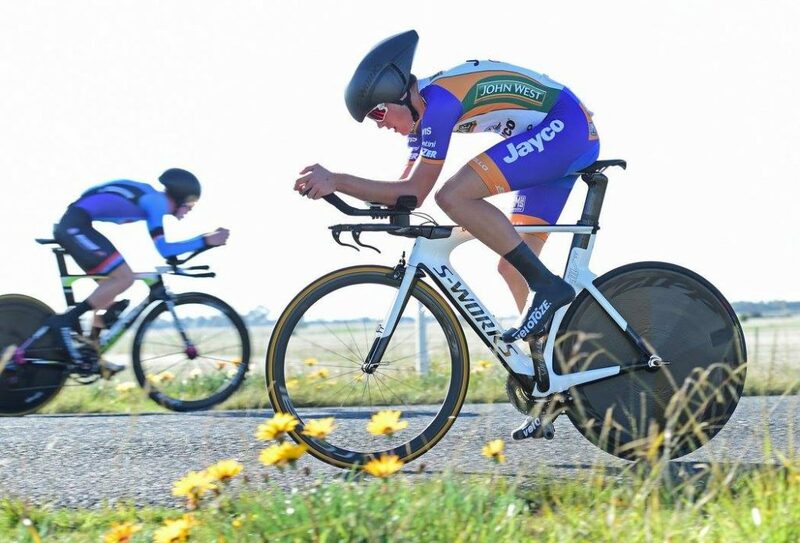 From InForm Tineli, Tom has been riding with the Victorian Institute of Sport, where under the guidance of Dave Sanders, he’s taken the leap of riding in the National Road Series. At 16, Tom has been forced to learn the hard way, riding against men in their early to late twenties who are aspiring for a European gig. However, the proof is in the pudding, with Tom’s recent consistency across all disciplines being a testament to the “throw them in the deep end” approach. What separates Tom from others? DNA is one thing, but the endurance and neuromuscular conditioning cycling demands, means it doesn’t get you very far unless you’re prepared to do the hard work. Speaking with Tom’s coach, David Sturt, it’s clear Tom has a rare ability to dedicate himself to the work effort required for elite performance. His work ethic is bolstered by a focus and determination to intimately review and research competitors, race courses and conditions. For example, Tom was well acquainted with the time trail course before race day, ensuring a blend of strength and riding precision would enable optimum results. Tom Jones is modest, gentle, friendly, and unassuming, but put him on a bike and the opportunities are endless. The icing on the cake for this potential future cycling star is his character and attitude. Congratulations Tom a beautiful young man who has worked very hard. Congratulations Tom. Wishing you all the very best in your journey to achieve your dreams. Such a nice, well rounded kid from a solid family. The amount of work he and his family have put in to achieve such a goal has to be congratulated. Thanks Dale, appreciate the comment. This kid is a real talent and to see his little brother who looks 10 get around the Hell Ride and even roll turns on Saturday blew my mind. These kids have got a very bright future. Great article. He’s surrounded by good people and will benefit greatly from that. Thanks for the comment Lee. Agree, lots of talent in that family!